Any idea what year this would be? Coastguards in Action. Station attacked and burned by Armed Men. 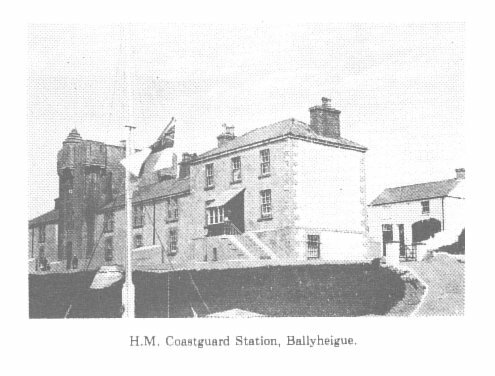 The Coastguard station at Ballyheigue was attacked on Tuesday night by armed and disguised men. The six Coastguards surrendered after making a fight and were relieved of their arms and ammunition. When the women and children had been removed to a place of safety the party set fire to building and burned it to the ground. The women and children were subsequently removed to Tralee in a Red Cross ambulance. Reference; Freemans Journal Thursday 27 May 1920. Irish Times 28th. May 1920. Co.Kerry : At 2 A.M. on the 26th. a party of armed and disguised men surrounded the Ballyheigue Coastguard Station, and compelled the crew, numbering four, to surrender. Some revolvers,arms, and a quantity of private property were taken away, after which the station was set on fire. Two revolvers and 150 rounds of ammunition were left intact. Paraffin and petrol were used to burn the building. When the raiders, on leaving Brandon Quay at 2 a.m., arrived they lit flares and were seen by the watchman who roused the others, and they rallied in the central tower. The watchman went up to the flat roof of the tower and when he saw 200 men he suggested that they should surrender, and the Chief agreed. They opened the door without destroying the confidential books and the raiders then set the building alight.